Are we at the intersection of an education revolution? Education revolution, these are buzz words that prompted me to think about what it means, and the implications on Higher Education, K-12, and even corporate education and training. The recent blossoming of MOOCs have sparked new waves of educational reforms, and most spectacular, education revolution – online education is now up-and-coming with its full frontal launch. This article on Come on revolution by Thomas Friedman has attracted 370 comments. These top-quality learning platforms could enable budget-strained community colleges in America to “flip” their classrooms. That is, download the world’s best lecturers on any subject and let their own professors concentrate on working face-to-face with students. All sounds good. What are the reactions of the commenters? For any course that can’t be machine tested, and that would include any course that involved critical thinking and advanced problem solving, whether in the sciences or the humanities, who exactly will review the research, the solutions or the papers? Who is present to challenge students, to moderate discussions, to give them considered feedback, to make them think for themselves? And where is all the informal education that takes place when students live together and share ideas and experiences based upon what they are learning? These are all good questions and there are divided responses, as to what it means when classes are flipped when teaching online. The instructivist approach with intensive short lecture videos and posting of lecture notes, powerpoints, examinations, quizzes in those MOOCs may be pretty effective in certain information transfer, and thus allowing students to acquire knowledge and skills in technical subjects, or subjects that have known and definite answers. That’s why true and false, multiple choices or even short answer questions would be effective and useful in checking students’ understanding of concepts. Such activities are often used in assessment in most traditional courses, from K-12, as they could also be easily marked, and viewed as “objective and valid” tools in assessment, if properly designed. Does it challenge students to think and reflect on what they learnt? To what extent are they effective in checking on students’ learning? What happens if there are no one “right” answers to the questions? How to ensure that students are not sharing their answers when responding to the questions online? How to ensure that learning is applied in projects, problems, or at work? How to teach in courses that involved critical thinking and advanced problem solving? I don’t think the traditional teaching by “lecturing” over the students would provide the solution to the learning of critical thinking and advanced problem solving. Why? First, critical thinking requires both educators and learners to re-think about the questions that need to ask, when wearing different but parallel thinking hats. At times, with the additional hats, this may lead to further thinking which is transformational. First, this is not some sort of neocon plot to destroy higher education. In fact, several upcoming courses such as “Health Care Policy and the Affordable Care Act”, taught by Dr. Ezekiel Emanuel or “Introduction to Sociology”, taught by Mitchell Duneier, promise to have ample room for progressive ideas and teaching. Second, Coursera and similar efforts are not meant to replace the traditional classroom. I am currently enrolled in a course on programming language compilers which is being taught simultaneously to Stanford undergraduate students. The instructor is using the ‘flipped’ model, where classroom time is used to dive deeper into the material and explore areas that normally would not be covered. The free online students don’t participate in this, but we are still getting the entire core syllabus as taught at Stanford. That’s interesting, as such learning seems to provide ample rooms for both the instructors and learners to flip the classroom. Engaging learners in the learning process is critical to online education, and even more so if a flipped model is to be successful. Flipping increases student interaction. That surely helps students in learning in a classroom environment. Is flipped classroom the solution to education? I think assessment is also an important part of active learning, not just the teaching. Many of those taking 6.002x already have degrees, and are using the course to sharpen skills for personal or professional reasons. Brian Ho, the owner of a software-development company in Honolulu who has a long-running interest in robotics, has an electrical engineering degree and is using the course to “refresh” his knowledge of the subject. Are these typical in the responses from the Connectivist MOOCs? There are strong views here on Faculty responses. Is that education? May be, it depends on the purpose of education, and its content. Is such online education or learning inferior? I don’t think so. See paper by Kop et. al. here that reveals learning experiences and pedagogy when learning in MOOC. Do not expect an overnight revolution, as much time is needed for teachers and students to understand how to utilize e-learning capabilities fully. Identify, target and support key likely benefits of e-learning, such as saving teachers’ time, supporting individual and group student working and opening new ways to reconfigure the geography and timing of class activities. Netagogy would then be used as a holistic pedagogy, integrating and embracing the different, and overlapping pedagogy – a pedagogy relating to Information and Communication technology, a pedagogy of abundance, digital pedagogy, and pedagogy in transnational education – transnational pedagogy. Is autonomy the name of the education game? Here is a report on how gamification in education works. Some experts call his approach an example of “gamification”: use of game-like elements to increase student motivation or engagement. “It is the use of game mechanics to make courses more engaging,” said Matt Kaplan, managing director at the Center for Research on Learning and Teaching at the University of Michigan. “Students will have to think, ‘How do I learn in this class, or where should I spend my effort?’ And they have to do it very carefully,” he said. Since the course is self-regulated, students have to take responsibility in building the coursework. And they have to have explicit goals early on and then take steps to achieve those goals. I have created a number of posts on gamification in education here, here, here and here. How many of the participants in MOOCs have ever thought about using Game Theory in facilitation, discourse and assessment (and grading)? First, I am not sure if there are any education training programs having game theory as part of it. Second, the win – loss in games seem to be too dangerous in education, especially when it would become a behavioral approach towards learning, manipulating people in order to achieve the goals and outcomes. Game Theory is used throughout business. The recent edX, MITx, Udacity, Khan Academy, etc. all use Game Theory to a certain extent. How? They all recruited lots of participants to join their “education revolution” and claimed glory because of that. The Professors got their sponsorships, fame through promotion of their courses, their flipped classroom theory, their ground-breaking teaching etc. So, why aren’t many others (in MOOCs) using such Game strategies to achieve similar Halls of Fames. I am not saying that we should sacrifice education with commodification and monetization. What I think is, if one (or George, Stephen and others) wants to play the game of MOOC, then the application of Game Theory would help in understanding how we could achieve, using a hybrid of education/business model which is sustainable. This similarly applies to Connectivism. I think the principles behind Game Theory is also part of Connectivism, when applied in education and learning. So, is Game Theory built on scientific grounds? Can Game Theory be used in online and distance education (as a business or personal learning)? The closest to Game Theory that have been used in education is Learning Analytics, and in theory it is based on a scientific approach. However, like Game Theory, there are still lots of ethical and privacy concerns. Also, those sponsoring the project would try every means to influence the outcomes, so that only favorable ones would be published, and unfavorable ones would be dampened or never published. That’s again a part of the Game – under Game Theory. In summary, I reckon education and learning is a game, and now it’s a different game that we all need to adapt in order to play well. Education Institutions could shape, respond, or adapt to the game as they play. This philosophy could equally be applicable to every educator and learner, as we are all part of the GAME, the Game of education and learning in this evolving and emergent world of education and learning. I have been thinking about this basic question: How does creativity impact on learning? To what extent is the following true? I would like to examine the assumptions behind these. 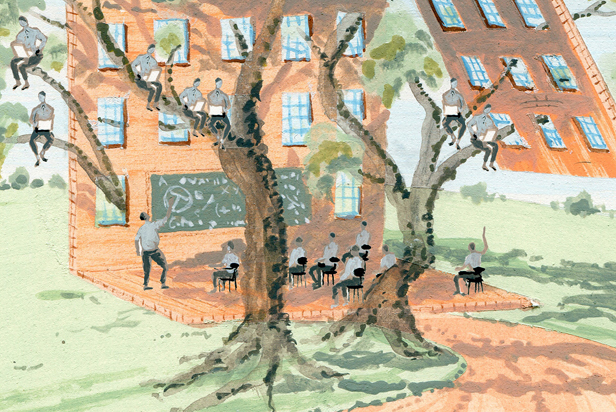 When the dropout rate of students is high, we need to ask: Why did students drop out? Posts on High School dropouts – here and here. “While there is no single reason that students drop out, research indicates that difficult transitions to high school, deficient basic skills, and a lack of engagement serve as prominent barriers to graduation. Most dropouts are already on the path to failure in the middle grades and engage in behaviors that strongly correlate to dropping out in high school. Various researchers have identified specific risk factors, such as low attendance or a failing grade, which can identify future dropouts—in some cases as early as sixth grade. Ninth grade serves as a bottleneck for many students who begin their freshman year only to find that their academic skills are insufficient for high school-level work. Up to 40 percent of ninth grade students in cities with the highest dropout rates repeat ninth grade; only 10 to 15 percent of those repeaters go on to graduate. Academic success in ninth grade course work is highly predictive of eventual graduation; it is even more telling than demographic characteristics or prior academic achievement. Unfortunately, many students are not given the extra support they need to successfully make the transition to high school. As a result, over one third of all dropouts are lost in ninth grade. The six million secondary students who comprise the lowest 25 percent of achievement are twenty times more likely to drop out of high school than students in the top-performing quartile. In response to these, what might be the options and possible solutions? For poorly motivated kids or school dropouts, surely the school environment may not be the best community for them to learn. However, there are lots of potential for these kids to be connected to others via the community, both inside and outside school, so they could develop themselves into adult lives. So why not leveraging the potential of community as part of their classroom activity to re-boost their interests of learning and socializing? – voice their views and opinions. Further research is required to explore how such connected learning based on informal learning outside school setting be integrated with the school education and learning. In reflection, this connected learning relates to Connectivism and Connective Knowledge significantly. Also the concepts of Conversation as part of the pedagogy in Community and Online Learning (see here and here) are not only valid for adult and community learning, but also crucial to K-12 learning, though the degree and depth of conversation among learners may vary, depending on the maturity of the learners, and the context of conversation and discourse. I reckon creativity is related to connected and connective learning. If we could help and support our fellow learners and educators in creating a learning environment and ecology via technology and media, then they would feel more comfortable and easy in connecting, conversing, cooperating and collaborating with each others, and be able to exercise their creativity and talents in the engagement, production and sharing of artifacts. Surely that would lead to networks and communities of learning that could fulfill their life-long and life-wide learning aspirations. I will continue to explore this in the coming posts. This is my second post relating to Authentic Learning. Here is my previous post on authentic learning, where I have thought about using community as the classroom. Jan’s video about authentic learning well illustrates the concepts and principles behind. 1. Academic tasks set in academic settings (Tests, quizzes, essays, lab reports, short answers questions, exercises). Jan remarked that more than 90% of the schools and universities are using these methods for assessment. 2. Realistic tasks set in academic settings. Jan suggested that this to be the authentic learning rendered possible in classroom setting. 3. Academic tasks set in a real setting. 4. Real tasks completed in a real workplace. To what extent is such authentic learning applicable to the classroom teaching, especially in High School and Higher Education Institutions? I have great interests in the teaching and assessment strategies employed by the 2 professors – Sebastian Thrun and Peter Norvig of Stanford University course on AI. George Siemens once commented on the way it (AI course) was structured, urging for transparency in learning and assessment (who is behind the scene) and a pedagogy moving towards more substantial active student engagement (a connectivist approach), when scaling it up with openness. As shared by Tony Bates here, and here in my previous post on re-inventing education, the teaching is based similar to the Salman Khan’s approach in posting videos instructing readers on the steps and concepts behind those theories, with examples. The assessment falls mainly with the academic tasks under a classroom framework, though it is still using typical assignments, quizzes, examinations to assess the learners. The use of computerized assessment further validated that it is more “decontextualised” rather than authentic in nature. Nevertheless, these are bold experiments based on an innovative approach, especially when it comes to openness in the instruction and interaction with the learners. So, here comes the first challenge, with online distance learning, where we don’t have enough background information of the learners, and then, as instructional or learning designers, we might have to exercise constraints, in order to make it effective and efficient, and be scalable, by using standardized test, assignments and quizzes (which would allow for computerized marking) and examinations which are criteria-based, not norm based. With openness, there comes competition, as the results of all assessment would then be compared to the norms of the cohort of learners, indicating who are the best achievers and who are the mediocre performers, and those who fail to achieve the minimum benchmarks. This could be a good and fair way of assessing learners, based on an objective system, from a teaching and educational point of view. But it could also lead to a dilemma. Are these courses designed for the elites, or the “average” students? Though the courses are open to anyone interested in the courses, there are pre-requisite skills for the course. So, it is not true that anyone would be able to follow the course, though one could argue that so far if you are interested in the content, why not just follow the course without doing any assignments, quizzes or examinations, as you could still benefit from it, by learning something new there. From a personal learning point of view, I think that is what open education could offer, and that is why I greatly appraise the professors and the University in making this education available and allowing students in interacting with the professors, through various means. However, when it comes to education, one of the greatest challenges is to check on students’ prior learning, the educational background, and how to assess on the learning progress of the students, through formative assessment. What happens if the learners are falling behind in the learning, in connectivity, or in the submission of quizzes, assignments or poor performance in examination? Learning analytics might reflect what would likely be the issues, when it comes to lack of engagement with the resources, artifacts, or failure to watch the video, or poor connectivity. But it may not reveal what the actual problems are, like the failure to understand the concepts behind the theories, or failure to remember the “answers” to the questions, or the failure to comprehend the lectures, due to lack of language skills (fail to understand English). How could authentic learning be applied in this situation? May be decontextualization is the only way to assessment of students on a massive scale, as computerized system is employed. Another question is: What are we trying to assess in a course? Is the course having standardized and rigid learning outcomes? Are the learning outcomes catering for the learner’s needs, or are they designed to cater principally for the accreditation of the course? “While residential lecturers have the luxury of seeing and knowing their students (I assume) in classroom interactions, open distance learning institutions never “see” their students – and open distance learning (ODL) institutions have to rely on up-to-date student profile data and learning analytics to get to know our students. Add to this that many of our foundational courses (modules) have more than 15,000 students per 16-week semester with relatively limited Internet access; then the issues Herrington raises such as “collaboration”, “coaching and scaffolding”, “authentic assessment” and “authentic activities” are real challenges. So, to what extent would authentic learning and assessment be applicable to classroom environment, especially in open distance learning environment? I reckon there are still some resistance, especially in the classroom environment, to resort to other means of learning, like on-the-job or workplace learning, or the project-based and problem-based learning with the learners at the center of teaching and learning, or being mentored or coached on a one-on-one or a small group, rather than being taught in the classroom, on a lecture basis. For a course which have “simple” learning outcomes, especially at a vocational education and training or high school level, what would the learners expect? Would the learners have expected quizzes, standard assignments, examinations? Most of the students have been accustomed to this form of assessments, and might even be comfortable to taking tests and examinations, where they could respond to challenging questions set forth. Would students like to accept authentic assessment tasks instead of taking examination? Yes, and no. Yes, when students realise that those tasks or projects would add significant values to their learning, or in preparation of the vocation or career that they are going to take up. No, since many students prefer to sit in a class, and listen to the “expert” teachers’ expositions, in the “transfer” of knowledge and skills, and then giving a “high satisfaction” rating to the teachers, because that is where they love the teachers, and how they have been taught, with their teachers “singing” the same song, because they are coming from similar or same cultural and ethnic background, entertaining them in the same way that they have been brought up, and engaging them in the learning process in the classroom. Teaching becomes the norm, rather than the exception in these sort of classroom learning situation, and is the expectation of most institutions. Isn’t it the perfect learning scenario? If both the teachers and students are highly satisfied with the “spoon fed” approach towards teaching in a classroom, where the learners could sit back and relax, why change? I wonder! You might have the answer to this! The above scenarios carried a lot of assumptions, and a lot of provocative special circumstances for me to reflect upon. Surely, not every student or teacher are like that, I suppose. However, the reality is, not every student is ready for changes, or willing to accept changes in the teaching or learning methods, unless they understand the values and benefits of those changes. Besides, there are many constraints on how teachers could go beyond the typical standard approach of using quizzes, assignments and examination and academic tasks. Unless there are sufficient proven research that authentic learning and assessment is far more superior to those standardized teaching and lecturing, or mastery learning approach, it is still challenging for both the teachers and students to experiment with the new and emergent approaches towards learning, as our research on Pedagogy of Abundance or Pedagogy to Support Human Beings reveals. Or we might have to resort to Learning Analytics to understand how learners connect and learn throughout the course, and apply intervention in an emergent manner to ensure the authenticity of learning. Postscript: George just posted this wonderful post with great insights. I would also like to respond to Clive’s post relating to massive scalable training here. I think it could work, and to some extent, it is already happening, in MOOCs. An interesting post on digital literacy. I came across this New Model for Higher Education created through Organizational Learning Contract. I will need to peruse the book so as to better understand how it works. It sounds useful for preparing students for careers and organization work. Does it differ from the e-portfolio learning approach? However, the use of Learning Contract – that may just be a variation of the Training Plan, has been in use in the Logistics discipline, here in Australia, for more than a decade. It seems to be a fairly common tool in place in vocational education and training, especially in the on-the-job training and mentoring programs. We have been practising such a vocational and education training model of “learning contract” for years, especially in the Distribution Centre Training where trainees could learn where, when, how, what and who they would like to have the training be done, and also addressing the why the training too. Here the trainees could exercise full control over their learning, especially relating to the skills required to accomplish the tasks and project required at work. Normally a learning team is formed, that is between the trainees, the trainee’s supervisor, and the trainer and assessor, in order to provide necessary support. Could this be used in the Face-to-face teaching and training environment? Yes, but so far, learning contract could not be easily adapted as there are constraints as to how training is to be conducted in a classroom or workshop environment. For part-time trainees attending face-to-face classroom based sessions, the trainees could develop learning contracts at work, which would then form the basis of assessment evidence of competency. Could this be used in the distance and online education environment? Yes, for sure. This would surely be useful in developing a structured, though flexible learning program based on the learner’s needs, especially when such program is supported by Mentoring support with facilitator and peer learners. How about learning contract in MOOC? I think I have addressed this in my previous post here and here, relating to my views on the design and delivery of MOOC, and how learning could be achieved and assessed. Organisational Learning contract may only work if it relates back to the learning at work, within an organisational setting. 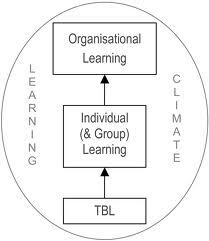 As week 4th topic is on Connective Knowledge, Collective Learning, would organisational learning contract be a viable means to structure the learning? 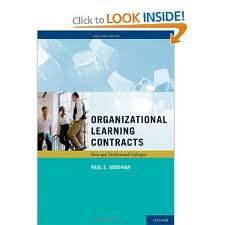 Have you used organisational learning contract in your education, training and learning? How effective is such a tool? How does it compare to e-portfolio and PLE/PLN in the development of learning plan?